"Emily Duncan has crafted a beautiful and brutal world and magic system. The focus on religious conflict is also fascinating and at the core of Nadya’s motivation... I was absolutely enthralled by the cutthroat war and relationships in this book... Most of the story is building up to the action-packed finale. I have not read anything quite like it recently, and I enjoyed the unpredictable ride it takes readers on... I highly recommend WICKED SAINTS to fantasy readers. Emily Duncan’s writing style reminds me of Leigh Bardugo’s. 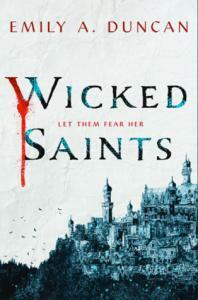 If you enjoyed the setting of Grisha Trilogy and the characters of SIX OF CROWS, I believe you will enjoy WICKED SAINTS. Duncan’s debut novel is perfect for readers looking for intrigue, dark magic and betrayal on every page." "If you like your young adult fantasy full of ice, blood, and angst, Wicked Saints will sweep you up in its wintery embrace." "This is the novel of dark theology and eldritch blood-magic that I've been waiting for all my life." "Rarely does a dark, magical epic have so effective a character-grounded sense of humor." "This dark fantasy starts off with a bang... The upfront presence of the gods adds an intriguing twist to a brutal story. The ending is as powerful as the opening, and there are explosive elements waiting to detonate in the expected sequels."